The Minnesota Wild’s blue line is broken. A group that entered the shortened 2013 NHL season dependent upon the improvement of players like Clayton Stoner, Justin Falk, Nate Prosser and Marco Scandella has never really come together. In the long-term, the development of Jonas Brodin and Mathew Dumba will wash Minnesota’s blue line blues away, but in the short-term better play from 23-year old Jared Spurgeon is the best fix that head coach Mike Yeo can hope for. Despite a strong season from goaltender Niklas Backstrom and an offense that has produced more and looks significantly better and deeper than one year ago; the Wild still prepare for the final week of the regular season with their playoff future up in the air. It will be of some comfort that three of their final four games are against division rivals whom they have dominated so far in 2013, but the stakes are very high for a franchise that needs to make the playoffs this season. [See also: Playoffs or Bust: Important 11 Days For Minnesota Wild]. The persistent identified weakness of this Minnesota roster has been the blue line. Besides the reliable minute eating top pairing of Ryan Suter and rookie Jonas Brodin [see also: Jonas Brodin, the Calder Trophy and Everything Wrong With NHL Awards], there hasn’t been a pairing that Yeo can rely on game in game out. That’s a major problem for a team that plays a defense-reliant system. Tom Gilbert was expected to anchor the team’s second pairing, but has ultimately been a disappointment. His 11 points through 39 games is the slowest scoring pace of his NHL career and he has even recently been taken off of the power-play. Gilbert’s defensive performance has been inconsistent as well with his transition game arguably his most disappointing aspect. There’s little doubt that the 30-year old has the skill set and talent to be a very effective two-way player, but for whatever reason he hasn’t clicked in Minnesota so far. Gilbert’s regular defense partner Clayton Stoner has actually played reasonably well all season long. The simple problem for Stoner is that he is a limited stay-at-home defenseman. His first pass still goes astray too often and his overall shakiness on the breakout leads to turnovers. This would be less problematic for that pairing if Gilbert was playing to his potential. Unfortunately, that unit has been reliably unreliable all season long. Prosser, Scandella and Falk have all spent time on the team’s bottom pairing. Unfortunately, none of them have been able to grasp the opportunity and issues higher up the depth chart have only put more pressure on the whole defense corps. Veteran Brett Clark is the latest man to take on the role. The 36-year old is still trying to adjust to the system and it would be no surprise to see Clark sit out Sunday’s game if Yeo decides to shake things up following the 6-1 loss to the San Jose Sharks. There’s no doubt that this blue line will need to play better over the final four regular season games to guarantee a playoff spot and it will definitely need to play a lot better if the Wild are going to make any noise in the postseason. There’s really only one place to look for significant improvement in the short-term and that’s Jared Spurgeon. The third year defenseman started the season penciled in alongside Suter on the team’s top pair. However, an injury sustained just three games into the season derailed those intentions. 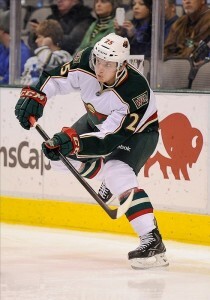 He returned in mid-February and actually played a pretty significant role during the Wild’s hot spell. In a stretch of 15 games (Feb 28 – Mar 29), Spurgeon scored five goals and seven assists. He also averaged more than 22 minutes of ice time per game and was a +10. In his other 20 appearances this season Spurgeon is a -10 and has just two assists. At this critical point in the year Yeo and the Wild need more from their young talent. 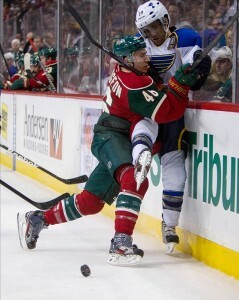 Spurgeon’s 5’9″ stature means that he will inevitably lose his share of battles along the boards and in the corners. However, in recent weeks he has also been missing far too many defensive assignments and has been too careless with the puck. In theory Spurgeon, who is a good skater and has good instincts when in possession of the puck, should be the perfect partner for the likes of Falk and Clark. Spurgeon has the talent and ability to lead an effective defense pairing in the NHL right now. If he brings his ‘A’ game then that will take pressure off of the Gilbert-Stoner pairing and make this defensive corps click more easily as a whole. If that happens, then maybe the Minnesota Wild have upset potential in the first round of the playoffs. If it doesn’t, then the final week of the regular season could be nerve racking for the Wild fan base and this team will definitely be knocked out in the first round. Jared Spurgeon has shown enough over his first three NHL seasons to earn a little patience in terms of his long-term development as a defenseman. That doesn’t stop a Minnesota organization that wants to succeed now from hoping for just a little more from the Edmonton native over the next couple of weeks.